John Smoltz was on the Dan Patrick Show today (which I listened to on 96.3 The Big Jab) and finally nailed down a time for his Red Sox debut. 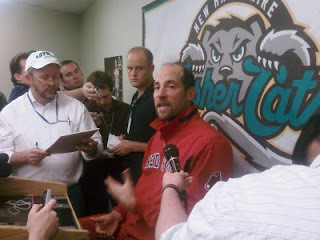 "Probably Tuesday or Wednesday," said Smoltz. "It depends on some variables, and I have to make another start (in the minors) before then." So it looks like the Red Sox phase in the Hall of Fame career will begin Tuesday or Wednesday in Washington against the Nationals. Update 4:08 PM: Amalie Benjamin from the Boston Globe has just tweeted that Smoltz is pitching Thursday against the Nats.